Renewing your cabinets is a quick and easy way to add value to your home and update your kitchen without spending a lot of money. Cabinet renewal consists of giving your cabinets a facelift instead of replacing them outright. This process can be completed easily with paint. Refinishing your cabinets can be somewhat time consuming, but the end result is well worth the effort. Patience is the key to having beautifully renewed kitchen cabinets. 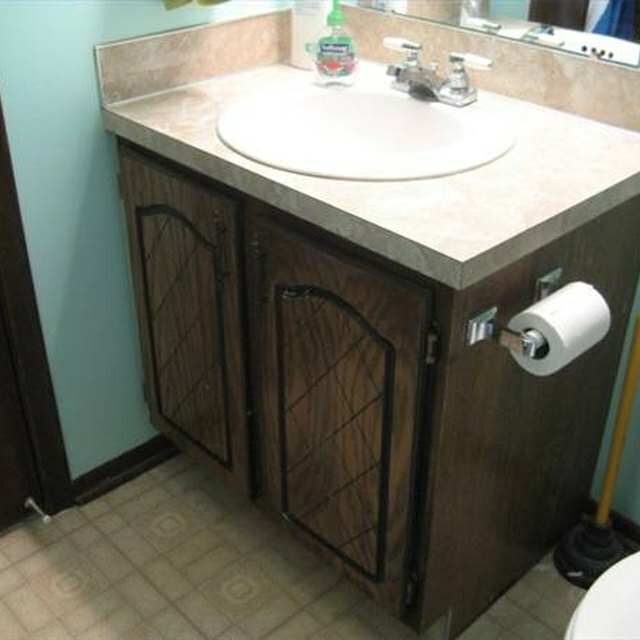 Remove the cabinet doors and hardware. Start by removing all the doors from the cabinets. This makes the surfaces easier to manipulate as you work. Simply unscrew the hinges from both the door and the cabinet. Do this for each hinge and set them aside as you will be using them again, unless you plan to update the hardware as well. Unscrew the handle or knob from the door. The screw is on the opposite side of the door from the hardware. Clean the outer cabinet surfaces and doors. Gently rub a cloth dampened with mineral spirits or acetone over the exposed cabinet surfaces and doors to remove oil, dirt and food particles that may hamper the adhesion of the primer. Make sure that you wear gloves during this process. Sand the exposed cabinet surfaces. After the solvent dries, gently scuff the surface of the cabinets with light-duty sandpaper. This gives the paint something to grab on to. Cover the cabinet doors and outer cabinet surfaces with a quality primer. This is one of the most important steps in getting a quality finish. Primers help block stains and give the paint a good surface for gripping. Carefully roll and brush the primer onto the doors and cabinet faces, making sure to apply an even coat. Attend to any runs immediately to prevent irregularities in the final coat. Allow the primer to cure thoroughly. The drying time will depend on the product you are using and ambient air conditions, but most primers will cure in eight hours. Apply a second coat of primer. This step may not be necessary if you were able to achieve a thorough coat of primer with the first coat, but if the primer appears to be thin or if there is unevenness, apply another coat of primer in the same fashion as the first, and allow time for curing. Apply paint. After the primer has completely cured, you can begin to paint the cabinets. Once again, paint grade choice will make a difference. Lesser grades of paint or paint that is not intended for cabinets will result in a less durable finish and necessitate repainting sooner. Choose a good grade of cabinet paint and have it tinted to your taste. Apply the paint with a small sponge roller and an angled 1” cabinet brush. This will produce the best results with the fewest brush and roller marks. You will need to apply at least two coats of paint, with a thorough drying period in between, to achieve the best results. Re-hang the cabinet doors and reinstall the hardware. Simply reverse the process of removal in order to re-hang the cabinet doors. Using the right equipment makes all the difference when it comes to painting cabinets. Although the smaller implements make for a longer job, the results are more consistent than with a standard roller and brush setup. You can apply the paint easily into corners and around trim. Make sure to use drop cloths to prevent lengthy cleanups. Can You Use Latex on Melamine Cabinets?